This is a nice lamp that is sturdy and well made. It looks beautiful in my living room as an accent with my furniture. Shade is also nice and well made. Recommended! I was very impressed with this lamp. It has a beautiful deep amber/brown finish and it is very sturdy. Sometimes these types of lamps are a little unbalanced but this one would be hard to tip over. The detail was more attractive than I thought it would be. The lamp shade is very nice and a little larger than it looks in the photo but it fits into the space I selected perfectly. Very elegant. My Family Likes These Floor Lamps. This was the first purchase I ever made on Overstock. I bought two (2) of these floor lamps to put on either side of our piano. Our piano cost us a lot of money and was a gift my wife made to herself after wanting one for our entire married life (35 years). I looked for floor lamps for a long time, at many different retail stores and online. It was a gamble I was taking, but I figured for less than two-hundred dollars I could afford to throw them in the trash if my wife didn't like them. She had no idea of what I was about to do. I read every review on Overstock and figured that assembly might be a bit of a problem. Assembly was a piece of cake. I had both lamps assembled and in place at the piano, with 3-way bulbs installed in less than 30 minutes. The most tedious part was taking the wrapping plastic off the shades. They did such a good job with this that you might want to leave the plastic in-place; but I did not. I set them up, turned them on and waited for my wife to return home. She loves them. She always turns them on when she sits down to play, day or night. They are really nice, create a woderful mood and I'm happy in every way with my purchase. This floor lamp is really nice. Very solid and is exactly as described. The stem and base of the lamp does have a reddish hue to it, this is what I wanted as it matches my decor, but know that the lamp is a reddish brown color. The shade is beautiful and the lamp has an overall lovely appearance. I'm using the lamp in my great room and it looks great there. There was some installation, nothing really hard. The base that the lamp shade sits on was a bit uneven, but with some "gentle" bending, I got the lamp shade on straight. Overstock had fast delivery. Overall, very happy with this purchase as I priced floor lamps in furniture stores, TJ Maxx/Marshall's and I couldn't find anything comparable in looks and quality at this price! Happy Customer!! This is my 2nd product I've bought from Overstock. I've gotten past the fear of the unknown, because both products including this lamp, have been great finds! The lamp is sturdy, stylish lamp shade, decorative enough for my living area, and fits with our antiques. Actually, it's the style of lamp that modern to Louis IVth could handle. For the price, I haven't found anything in our are furniture stores to compare in style and price. A good buy - AND came TWO days later! It's like bringing it home from the store. East assemble! What a great lamp for the value!!! This is the 6th floor lamp I've purchased for my home and I just wish I would have checked the O before purchasing others. I paid 3-4 times the price for most and the one I bought from the "big box" store looks cheap. Great quality lamp for the price. This floor lamp is the "light of my life"!!! 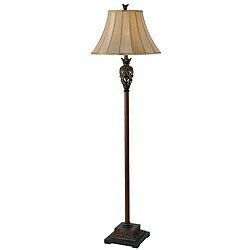 Purchased floor lamp for my family room!! Looks great and I love the gold tone shade. I needed a 3 way lamp for my hubby...who reads the paper in his favorite recliner and didn't have enough light from overhead ceiling fan light! There is no place to put an end table near the recliner so the search for a good quality...resonably priced floor lamp was underway! I looked on Amazon.com.....nothing!! I looked at TJ Maxx & Marshalls...nothing! Then I looked at Overstock.com and found exactly what I was looking for!! Love...Love ...Love!! Looks expensive like I bought it at a pricey lighting store!! This lamp is beautiful and quite heavy. It is the perfect height and would go nicely in any decor. The base and shade are neutral enough to make it very versatile. My only complaint is regarding the shade and finial. Both should have been factory rejects. The shade is crooked; i.e., it is lopsided/out-of-round and the only way to make it look straight is to rotate the lower part to the back side. That only works if there is a spot you can put the lamp where you will have a "back side". The finial was so misshapen I had to throw it away and put a generic on, which takes away from the whole look of the lamp. The finial was made from resin and was leaning more than the tower of Pisa. There was no fix for that, as it was threaded straight but you could not put it on the lamp without it pointing to one side! Regardless, I would order this lamp again because it's beautiful, and the two quality related problems with mine were no doubt a fluke. I had purchased a couple of lamps from another store and was looking for a floor lamp to compliment them. I didn't want to spend over $100 and so stumbled upon this one. For the price I expected something okay, but I have been extremely happy with the look of this lamp. The shade is well made and lined, and the lamp itself is very sturdy and solid. I would highly recommend this lamp to anyone. For those trying to match finishes, the wood does have a slight redish tint which is not very clear in the photo. I am very pleased with this lamp. The look ,the price and the quality were very satisfactory. I am a very fussy shopper. Price was very reasonable compared to other online sites and in-store pricing. Nice lamp and perfect golden light nad perfect hue. Great floor lamp for the buck. I'm always concerned with quality, and some of the other review I read were helpful. This lamp exceeded my expectations. Perfect fit for what I needed. This lamp looks ok from across the room, but looks cheap up close. It has a redish tint to the pole. The base is very sturdy. I had to replace the part the holds the lamp shade because it was lopsided. It is also a bit shorter than I had pictured in my mind. I am keeping it, but wouldn't purchse it again. The color is exactly as pictured and the quality is very nice for the price. It looks great in our living room, but would also compliment any room. I would recommend. This is a great lamp. I wound up moving across country and letting most things go, including this lamp. I tried replacing it with another brand, but wound up donating that one and buying another of this one. This one is sturdy with a fabric shade. Very nice looking and gets many compliments. Liked this so much, I got it for my son ! Every night I turn on this lamp and enjoy looking at it as it glows in my family room corner. Very well made and just lovely. You will not be disappointed. This lamp is so beautiful that when it came, we placed it in the formal area of our home. We originally bought it for our downstairs kids sitting room. High quality lighting, too. This lamp is beautiful, classy, and antique-ish...yet, it's a shorter lamp. I wanted a shorter lamp, so it's perfect for my needs...just FYI. The post leans, and the shade is crooked. I like the 3-way switch, which is why I purchased, but next time I will spend more to get a sturdier and higher quality piece. This is a nice sturdy floor lamp. Has a bit of an old-fashion design and feel. Not too modern and I liked that. "Can I use a comparable CFL bulb?...The three way function is not important, just would like to use an energy saving bulb." Thank you for shopping with us vackar123. Yes you can use a comparable bulb. Have a great day. I bought this floor lamp to match a hand-made lampshade and it is stunning! The colors in the base tie in with the multi-colors of the lampshade and make a dramatic statement in the corner of the room. "Does the height measurement of 63" include the shade? If not, what is the height with the shade attached?" Measuring on a carpeted floor, I get 62 1/2". That would be to the top of the finial on top. Measurement on a hard surface floor might get the measurement of 63". Yes, the shade is included in the measurement. It is the perfect height next to my sofa. "What is the ornament at the top of the lamp?" We are sorry, but we are unable to provide a detailed description of the ornament at the top of the lamp. From the picture, it seems to be shaped like a tulip or the top part of a pineapple. The finial on top are leaves. They are quite pretty. They are the same color as the lamp base. "how heavy are these lamps"
This lamp is 16 pounds. It is sturdy enough to stay upright even when lightly bumped. I have had 3 dogs playing (which they are not supposed to do in the living room)and they have bumped against it and the lamp did not fall over. "What is the dimensions for the base of the lamp?" The base is 5 5/8 inches wide by 5 5/8 inches long by 5 inches tall. The base is 3 tiers, and starting from the bottom, the tiers are 9 1/2", 7 1/2" and the top one is a little over 5"
Unique Loom Attiki New Classical Rug - 8' x 11'4"